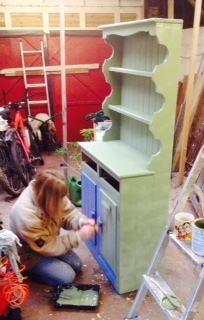 I had the day off today to start the refurbishment of an old dresser. My parents had it made in the seventies and gave it to me when I bought my first house. Back then honey-coloured pine was all the rage – I remember this dresser in the family kitchen with its matching table and benches. At some point I painted it blue, but for the past 3 years it has been at the back of Mr Shoestring’s workshop gathering dust. 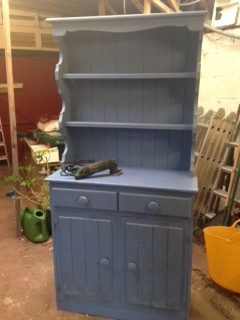 It is a cute little dresser and is the first part of our planned redecoration (on a shoestring, of course) of our kitchen – Mr S is going to remove the ugly breakfast bar to make space. We chose a chalk finish pale green. Today I sanded it, washed it thoroughly and applied the first coat. It is looking very encouraging so far! Hopefully I will get the final coat on tomorrow and will wax it over the weekend. 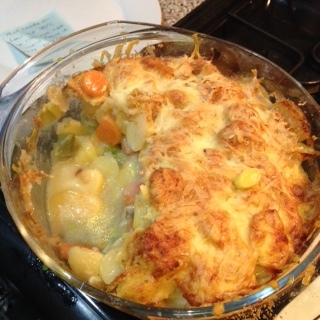 Because I knew I probably wouldn’t fancy cooking when I got in, I prepared the dinner before I went, a very simple veggie bake based on Delia’s Leek, Carrot and Potato Pie which features in my original copy of Frugal Food. It was perfect after my day freezing in the workshop – warming and comforting. 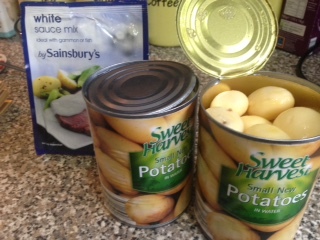 I used tinned potatoes to save time – they are 15p in Aldi and I couldn’t buy fresh for less – and also a packet of bechamel sauce that cost 10p from Approved Food. Half of the leeks were from the garden – the last of them – and the other half came from Aldi this morning from their Super Six range and cost 59p. Cook the carrots in boiling water until cooked but still al dente. Sweat the leeks, onion and mushrooms in some butter until soft. Season well to taste. Drain the carrots, reserving 1/4 pint of water to make up the sauce, then follow the instructions on the packet but replace half the suggested milk with this water (or make a bechamel from scratch so that it can be gluten free if necessary). Slice the potatoes. Arrange the vegetables in layers in a deep casserole dish, finishing with a layer of potatoes, seasoning as you go. Combine the breadcrumbs with the cheese and cayenne and sprinkle on the top. Bake in a medium oven (180C) for about 40 minutes until the topping is golden brown. Serve with a green vegetable and enjoy! « Leftovers risotto: waste not want not! Love the dresser! Wish I had room for one. Ooh, let’s have a pic! Me neither! Try [email protected] and I will publish it if you don’t mind? Love this blog. Have been reading for ages but have come out of the shadows to comment as I too have just renovated my mum and dads old dresser which was in my dad’s garage. Great minds think alike : ) . I think your blog is the most realistic and best written frugal blog out there.